So I’ve been a member for a couple of weeks but haven’t had a reason to ask any questions till now. I got ripped off last year on this quad and don’t care to explain it all. Just understand I paid too much for a machine that ran/drove but the guy was definitely not a mechanic. I’m not either though, I do know you can’t wire the starter positive ground and expect your wiring/battery to last all that long. I wish the fella I bought this pos from did. So my wrecked out 97 king quad needs a new intake valve but I went ahead and lapped what was there and got it to seal and reassembled. The new one is on order but I figured I can get it going and wait till that valve goes out of adjustment before tearing it down again. My new question is, can I have the spark plug firing 180* out of order? Or maybe on the wrong stroke? If so, can I fix the wiring end or would I need to remove the cam and rotate the piston through another stroke to get me back into time between the compression stroke and ignition timing. Actually it would be 360* out( if the timing marks are lined up ).....it fires every other full stroke ,not 1/2 stroke....to answer your question, you will have to re-adjust the cam to change the timing if it is on the wrong stroke. Ok so now I’m wondering, do you set the crank at tdc by putting the “T” on the arrow of the case or use the line with the “0” on it? I assumed I was supposed to use the line n “0” but everybody just says “put it on the T” Do they actually mean use the t and forget the mark? I tried taking a picture of my crank setting. Can any one verify this as correct or not. That T should line up with an arrow on the outside of the hole, with both valves closed. Last edited by TCIII; 03-24-2019 at 11:09 PM. Yes I guess I posted the wrong picture. Itâ€™s pretty difficult to get a picture of the arrow n timing mark. I have a better pic than one posted. So I ended my evening by pulling the carb off and tearing it down for a trip through the sonic cleaner. I then scrubbed the needle/seat with valve grinding compound on a q-tip to remove any varnish. It traveled very smoothly when riding the float up n down after assembly. I also successfully (first time for me) removed the emulsion tube and found it plugged tight, so it got a special trip through the sonic cleaner and blown dry at about 40 psi. 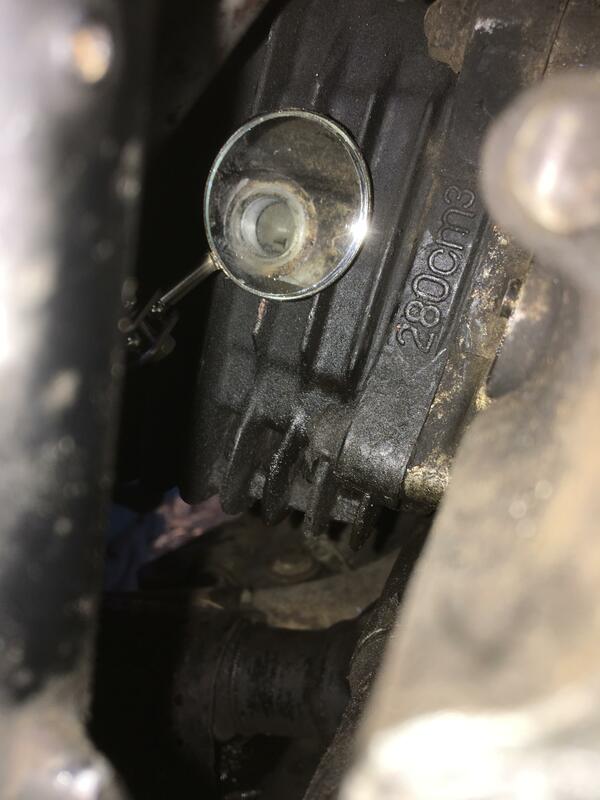 I also replaced the fuel mixture screws â€œ0 ringâ€�. The float seemed to be about as close to parallel as it can be with the bowls flange so I made no adjustment. Iâ€™m fairly certain that she is timed correctly, Iâ€™m not sure that setting the cam to either the mark, or the â€œTâ€� actually translates to a different tooth on the timing chain. I know my tensioner is about maxed out as it free falls to within 1/4â€� between my tensioner flange and cylinder mounting face. Though it still seems to ratchet itself into place. Maybe I oughta get a new timing chain on order. I havenâ€™t installed the carb yet to try it out. Sorry to hear you got ripped off. Buying a used ATV is scary for just that reason. But to offer some encouragement, I also bought a "basket case" King Quad 300. The difference is that I KNEW it was a basket case, so I planned to spend a couple of months working on it. Keep your head up, don't get discouraged. Just keep at it one job at a time and you will end up with a neat little quad. There are things about the King Quad 300 that you just don't get with a more modern ATV. For one thing, the size - they're so much smaller than say a Sportsman 500, they're easier to ride in the woods and can go places the bigger quads can't. The other thing is the super low range, it's perfect for pulling trailers or for climbing obstacles. You can still get most parts. The biggest problem I ran into was finding new plastics. Learning to "plastic weld" will help you there. As for your current problem, my first thought was that you weren't at TDC, but it sounds like you made sure that you are. My next suggestion is to make sure you have the valve lash set properly. It can be a PITA to get right, I had to work at it a couple of different times before I got it right. Once you're sure that's right and you're sure you have spark, fuel system is the next likely culprit. I had a deteriorated rubber fuel line that had collapsed and was blocking fuel flow. It made me crazy, I KNEW everything else was right and it still wouldn't start. I went through everything you're going through and even sent the head off to Millenium Tech and had them do a valve job. As long as you don't give up, you'll get it eventually.